For this birthday cake, my client had one request: ruffles! Because ruffles are so labor intensive, the cost can be a bit higher. For this reason, we compromised on a half ruffle ballerina skirt which gave her the ruffles and look she wanted while still staying within her budget. The half ruffle also gives a bit more of a delicate look to the cake. 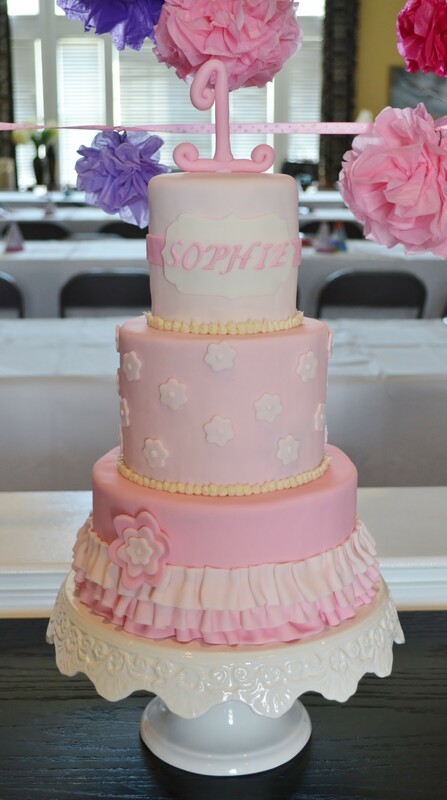 I completed the “girly” theme by using flower accents, a feminine name plate on the top layer, and a curly “1” on top of the cake.